One of the more nebulous aspects of a film definitively set in a real city, state, and/or country is how it captures its spirit. It doesn’t necessarily have to be representative of the actual location, but for whatever reason the movie tends to feel more authentic, more grounded in a mood than if it focuses too much on other aspects. Hell or High Water is a prime example of this importance, drawing on it as definition for practically every relationship and interaction. The narrative, following two brothers that rob small banks to pay off the debt on their family ranch and the one-month-from-retirement sheriff that aims to stop them, is simple enough, but what attracts the viewer is the attention paid to the times in between the heists, as the nature of the Wild West is explored and reinforced in modern times. This is not to say, of course, that the film loses interest when it comes to the heists. As directed by David Mackenzie, there is a great deal of tension brought forth by Giles Nuttgens’ slow camera moves, zeroing in on a hapless clerk as she is about to fall into the robbers’ trap. But until the unexpectedly violent final heist, there is hardly any violence, and the tension is occasionally defused by the brothers’ amateurish efforts and Tanner’s (Ben Foster, magnetic in his volatility) occasional temper, in ways that are both hilarious and worrying. 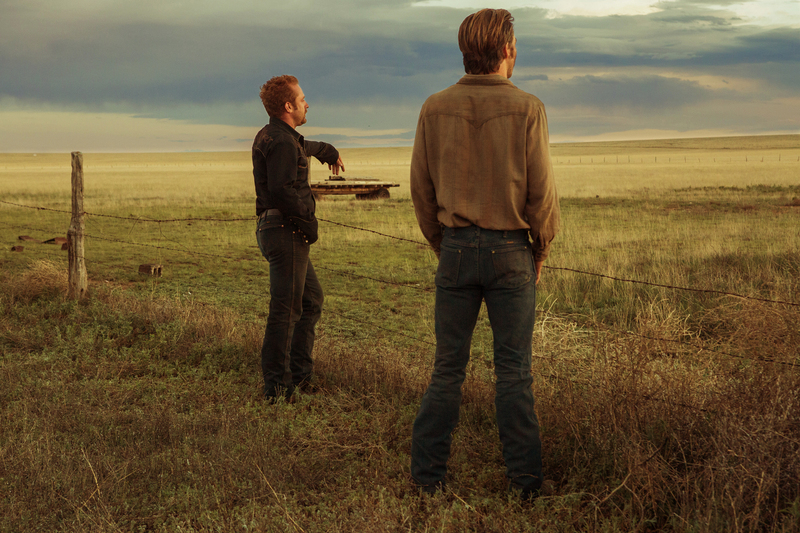 The brothers, Tanner and Toby (Chris Pine, enormously sensitive and stolid), and their relationship form the heart of the film, both in a narrative and an emotional sense. Despite their noticeable differences, from their emotional state to their backgrounds (Tanner is an ex-convict while Toby is robbing solely for the farm and his sons), there is a true tenderness, as the importance of family is emphasized from scene to scene. This is mirrored, most notably in a cross-cutting where the two pairs both stay in (vastly different) hotels for the night, by the playfully antagonistic behavior between the two Texas Rangers on their heels, Hamilton (an appropriately gruff Jeff Bridges) and Parker (Gil Birmingham, admirably understated). Hamilton is repeatedly mentioned as being on his last legs, but there is a burning drive that he shows in pursuing the robbers, while Parker offers support and receives frequent stereotypical jokes. Though this doubling certainly isn’t meant to be taken literally, it does ensure that the main through line, that of Texan thinking, is sustained.